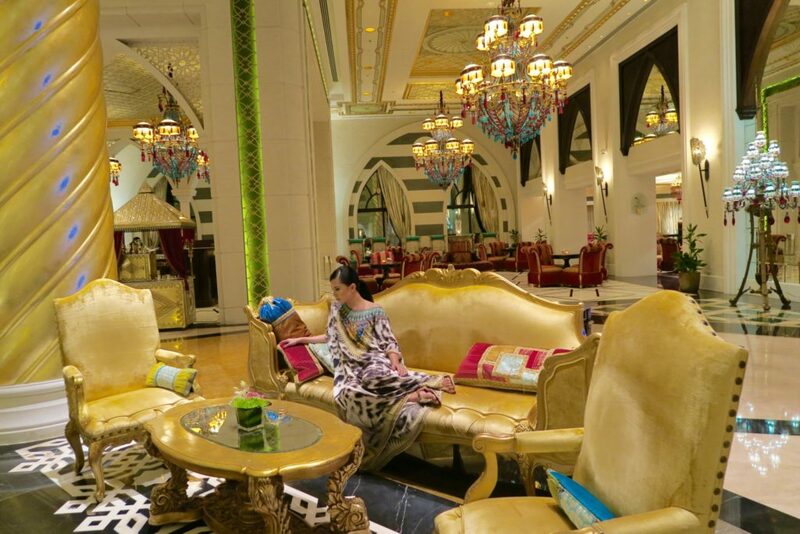 Hotel Review: Jumeirah Zabeel Saray at The Palm, Dubai - Holy Smithereens! Located on the west side of the iconic the Palm Islands in Dubai, the overall concept and design of Jumeirah Zabeel Saray is inspired by the imperial palaces of the Ottoman era. 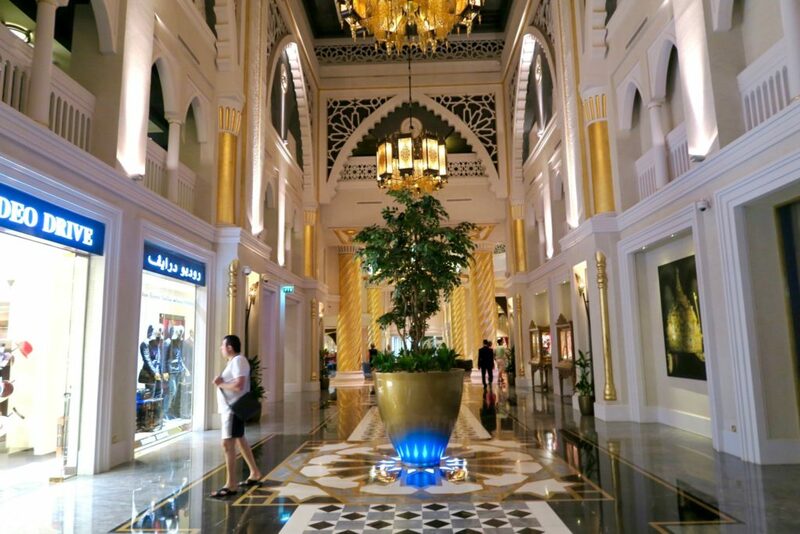 It’s a five-star hotel that may be ‘modest’ in size compared to the usual mega town-sized luxury hotels in Dubai, but it sure does not lack in opulence and luxurious details. The hotel is located in the lower West side of the big arc of this man-made island. To get to the ‘everyday’ part of Dubai, it takes about 20 minutes to leave the island by car, but taxis are considerably cheap in Dubai. Yes, the hotels in The Palm area can be rather isolated but that completes the appeal of being cocooned inside such luxurious surroundings. Gold rush. That’s my first thought when I saw the front doors of Jumeirah Zabeel Saray. 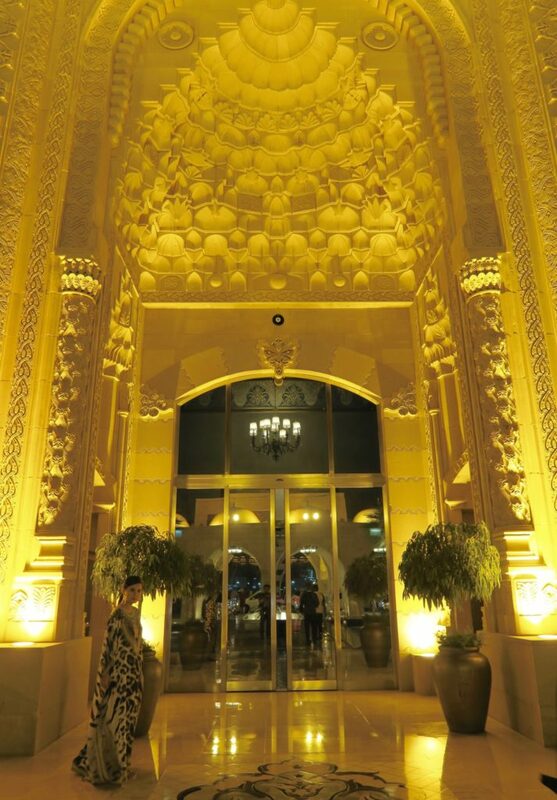 Bright yellow lights are aimed at the intricate carvings that make up the giant dome / entrance of the hotel. It’s the strong rush of musky floral hotel scent that greets me when the double doors open. This scent will soon become a familiar greeting whenever we entered the hotel. And before my nose figures out what kind of musky scent it is, the grand (the word ‘grand’ is quite an understatement) lobby appears. And then I realise that the heady scent is only apt for this kind of lobby. It all balances out. Check-in was done at the desk and we were handed refreshing towels and tea immediately. On the way to the room, I noticed that the two wings/ annexes of the hotel are lined with boutique shops, so the place has a trendy vibe as well. We checked in to a Deluxe King Palm view room. It offers 46 square metres of Ottoman-inspired luxury and also has a private balcony that has views of the Palm Jumeirah and the sea. To get a better understanding of just how Jumeirah Zabeel Saray does not ever lack in luxurious detail, do watch this video. 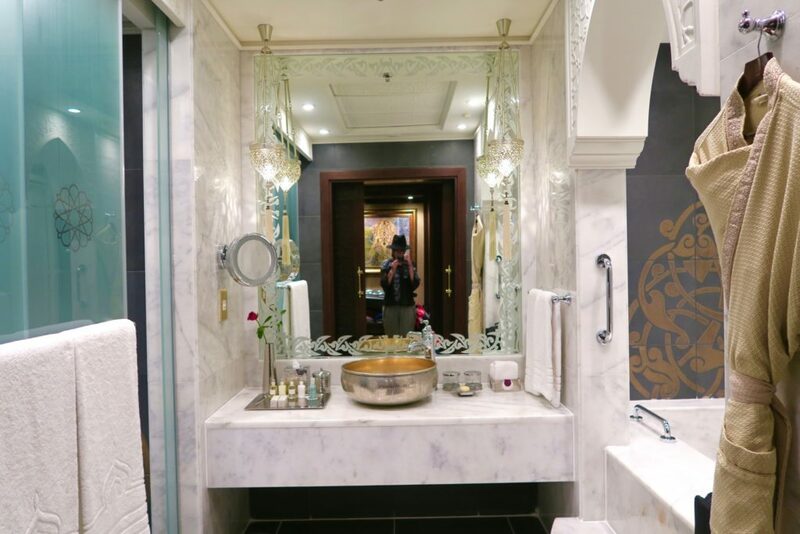 The bathroom style of Jumeirah Zabeel Saray proves that the size of a luxury hotel bathroom does not need to be palatial in order to be opulent. Featuring a single gold sink and a separate shower area, toilet and tub, the Turkish designs are very strong. The tub is particularly deep and wide and is meant for deep soaking. Toiletries from Quercus (of Penhaligon’s of London) is a perfect match for the bathroom. The Quercus line was created in 1996 and features a light burst of citrus and basil, alongside a combination of jamine and cardamom. It’s the absolute matched scent for the surroundings and I’m extremely impressed with the pairing. The citrus and basil offered a refreshing splash to the musk. 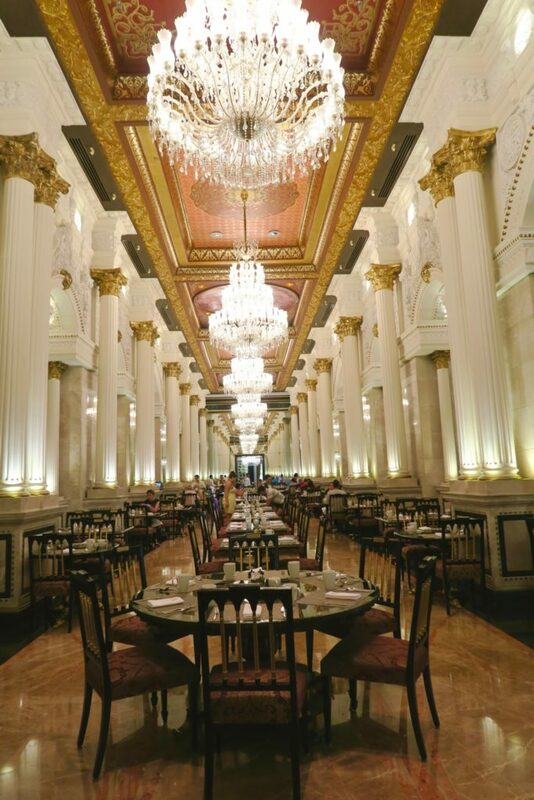 Breakfast is an extremely grand affair held at the Imperium Restaurant with crystal chandeliers and gilded columns. Breakfast times are usually busy in the hotel but you could hardly feel it as guests are distributed evenly in the spacious area. Due to the pool’s location overlooking the sea, it can be very busy during the day. My advise is to take a stroll at night when there are less people. 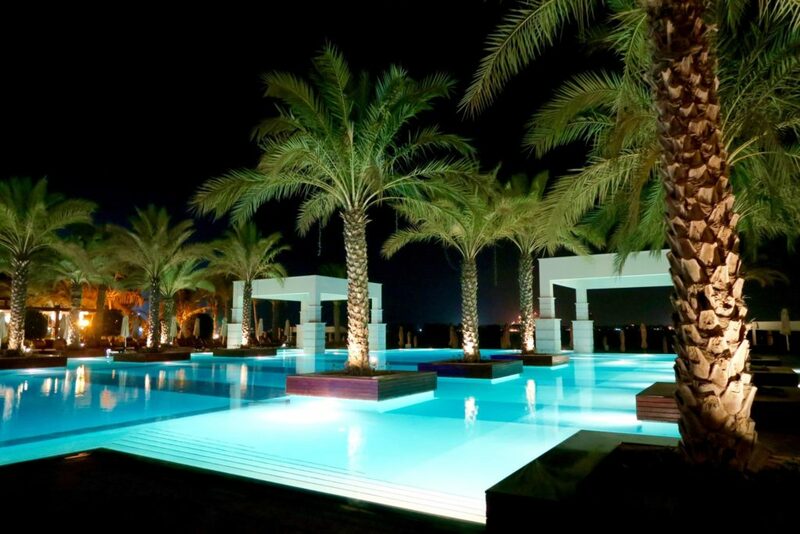 With the added lights and darkness of the night, the pool area makes for an extremely romantic area of the hotel. 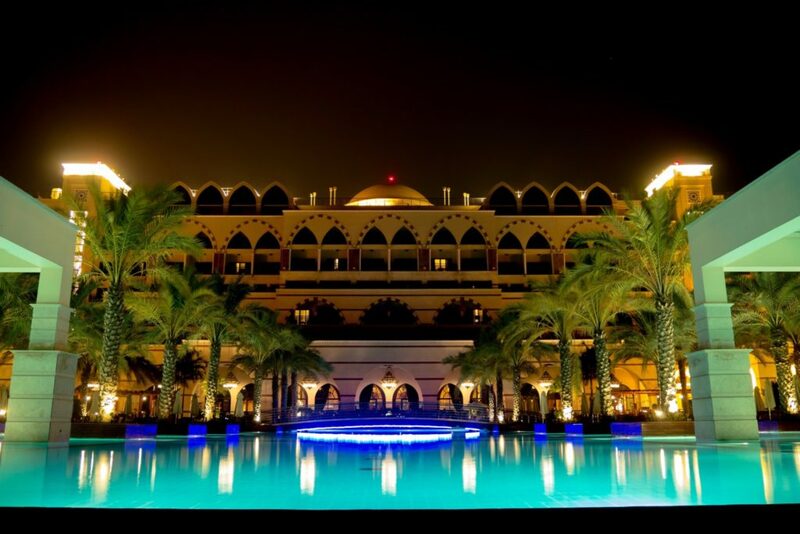 Perhaps the most visited and popular area of Jumeirah Zabeel Saray is the Talise Ottoman Spa. Winner of multiple awards including The World Travel Awards ‘UAE’s Leading Spa Resort’ in 2014 three years running (among many many others), the Talise Ottoman Spa is unlike any other spa I’ve ever set foot in. This extremely beautiful and exquisitely designed spa is also the largest in the Middle East and Africa, spanning more than 8,000 square metres in area spread across two floors offering authentic Turkish hammam. 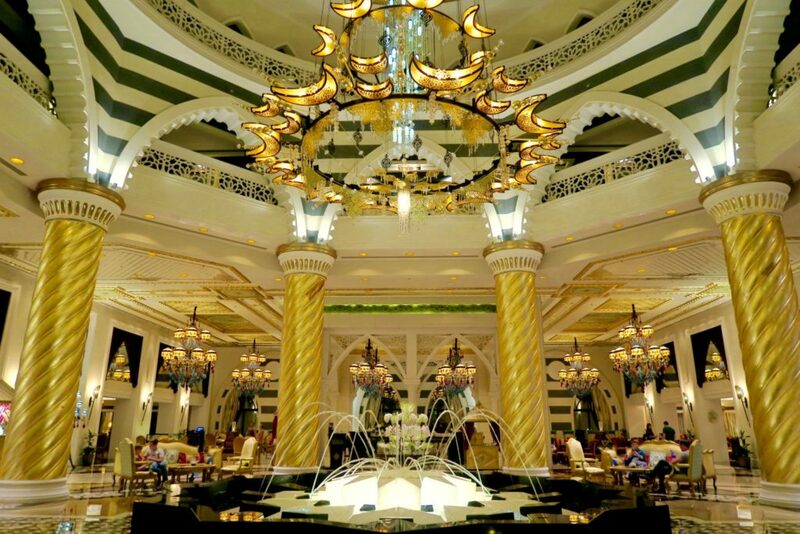 It’s not a lie to say that Jumeirah Zabeel Saray is dripping in luxury. Every corner seems to have been touched with Midas Gold. I would recommend a stay in Jumeirah Zabeel Saray for the sheer experience of being surrounded in such opulence. 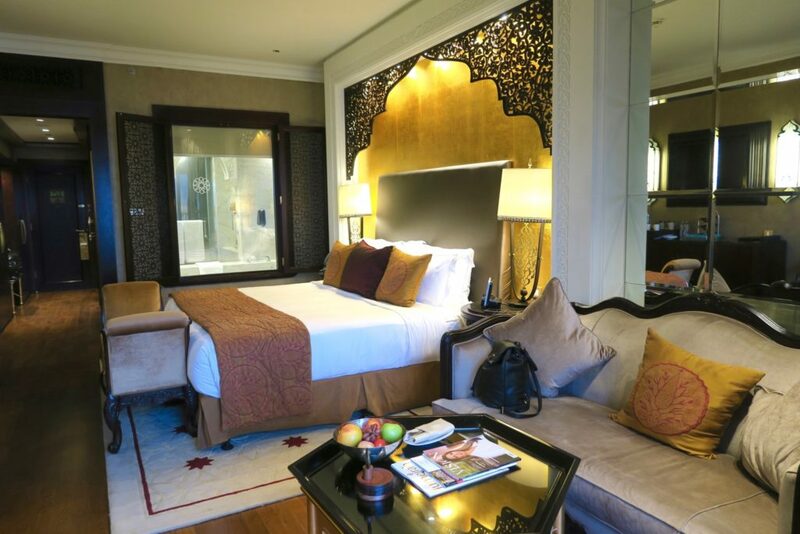 This is what Middle Eastern hospitality does exceptionally well – opulence and indulgence,and the Jumeirah brand really knows how to carry it excellently. 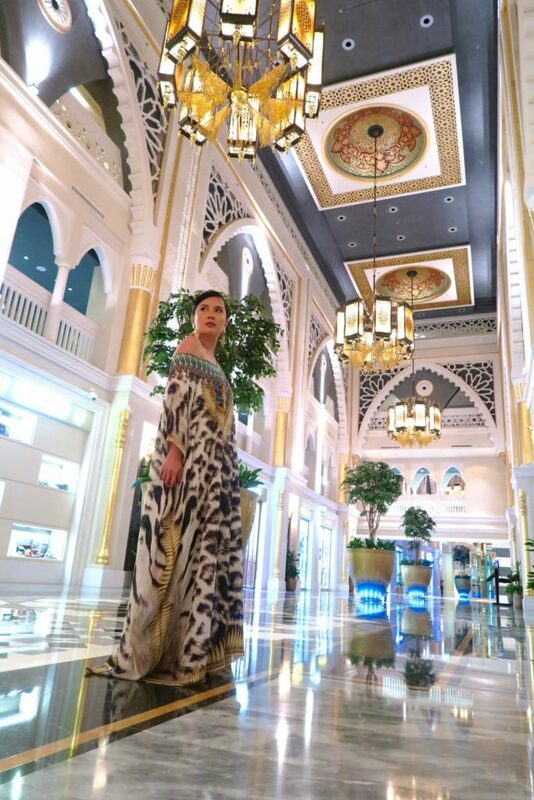 Dressing the part in Jumeirah Zabeel Saray is optional, though I’m certain that the inner sheike in all of us will come out voluntarily. A Deluxe King Palm View room starts at AED 1799 (AUD 650.00 ) per night, but special deals are always available online. Have you ever been to a place that brought out your inner ‘royalty’? And hotel scents – yay or nay? Goodness, that is opulent. That spa looks just amazing and worth a stay just to indulge there, I think. 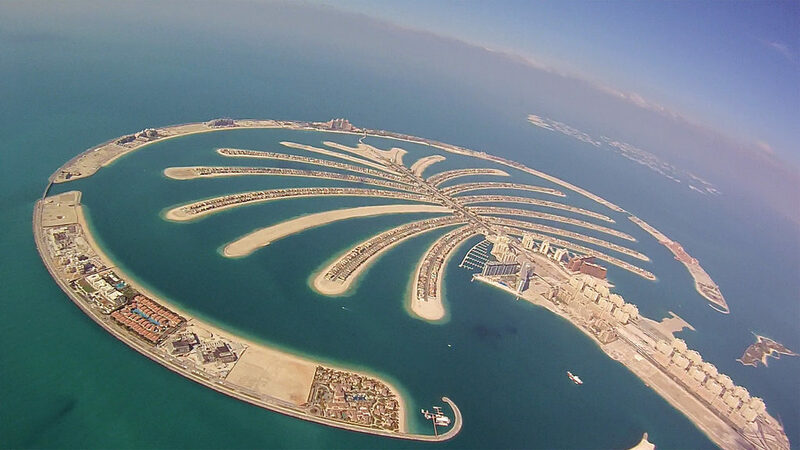 Funnily enough, we might be looking for a hotel in Dubai in the early part of May am am glad to hear that the Palm is so close by taxi to the rest of the city. The Spa itself is almost a tourist attraction, I think! It’s not too close in terms of taxi , but for me it’s worth it to avoid the hustle of “main Dubai”. Did you end up choosing a hotel? What an opulent lobby and I love the breakfast room. 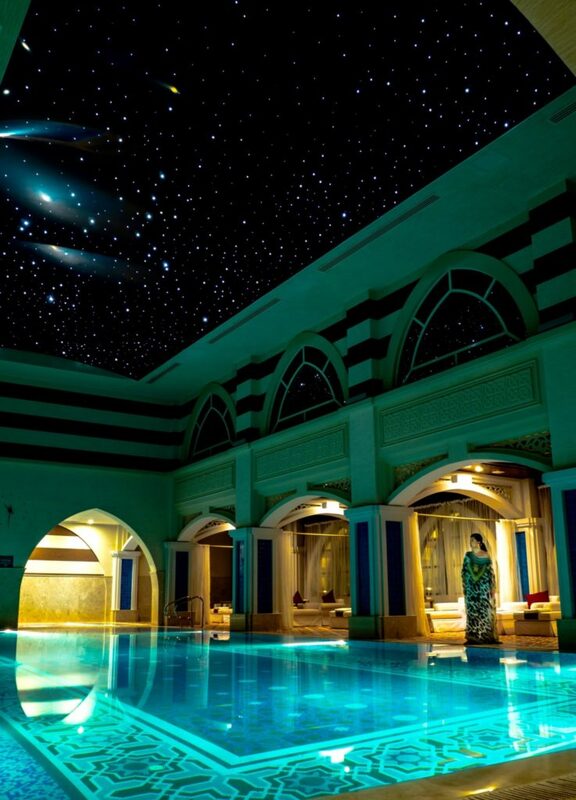 As for the spa, it’s spectacular! I’m not a fan of the Palm but that’s the hotel I’d want to stay in if I did stay there. I’ve heard several times how great their spa is. Great insight! The Talise Ottoman Spa looks awesome! We’ve also stayed at this hotel and it’s amazing. Inspired by this trip, I was blown away by the fragrance as you enter the hotel. My wife and I run a home fragrance and candle business and my team have been able to reproduce exactly this aroma as a home candle. Our web site is sorcha-home.co.uk. Please visit and let me know what you think.